The very first distribution of Linux that I used was Mandrake 8.0. It was simple to install (although on 3 CDs instead of a single DVD), it showed me the KDE desktop (still my preference), and it had pretty much every program that I wanted to use. Over the years, Mandrake absorbed two other Linux distributions (Conectiva and Lycoris), and was legally enjoined from using the name “Mandrake”. Now known as Mandriva, it has been beset by rumor and rumbles of financial troubles. However, I put a recent version on an old laptop and it’s done very well for my mother in law. Just over a year ago, a brand new distribution called Mageia was started. Created because lovers of Mandriva wanted to put the emphasis back on serving the community first, and amid worries that Mandriva’s future was uncertain, Mageia released its first version this past June. This is a look at it. I installed from the DVD version, which doesn’t have a “live” option. But you do get to choose which desktop you want to install. On the DVD you can choose KDE, GNOME 2.32, Xfce, or a couple of other window managers. The CDs are available only for KDE and GNOME, although the others can be installed later. You get a choice of installing to your whole hard drive, or a “custom” installation, which is the only way you can resize an exisiting Windows or Linux system, shrinking it to make room. I ended up choosing to install to the entire drive. One minor thing that bothered me about the install was that there is never a chance to “Quit” once you start the process. I hope that is fixed in the next major release – most installation wizards will allow you to change your mind and leave if you are in between the early steps of an install. 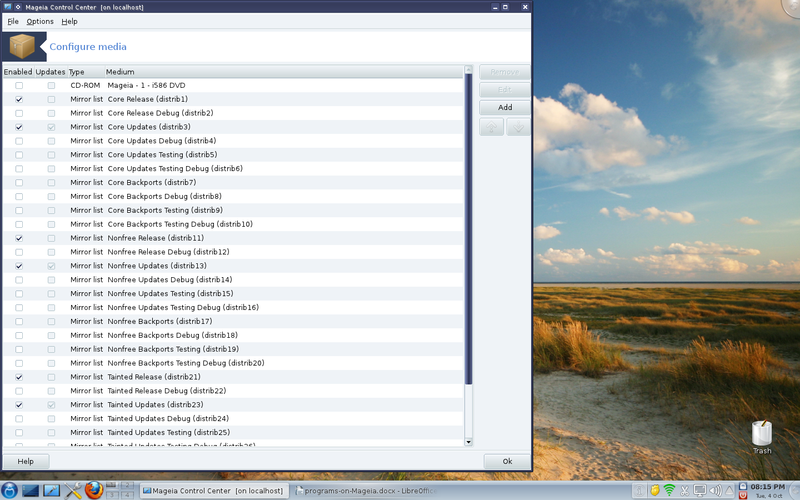 This is what the KDE version looks like on first booting up, sort of spartan. Mageia chose to modify the standard KDE setup, possibly to seem less strange to new users from Windows. If you are looking for more color, there are 19 wallpapers you can choose instead. There are 7 themes included, and you can get more. (I must say that the colorful wallpapers in distributions like Mageia make me envious as a Mint user). The Start menu is the KDE Classic style, rather than the KDE 4 default, Launcher. Right clicking on the blue cauldron lets you edit a few menu settings, and if you “unlock widgets” you get an option to switch to the Launcher style menu. The DVD installs a bunch of games, mostly from the KDE games collection. Included are Mah Jongg, Solitaire, a Pacman clone, Breakout, Reversi, Minesweeper, Sudoku, Battleship, a Risk clone, and many others. If you installed from CD, no games are included by default (for space reasons, presumably). The package manager, (called Software Manager although it is still rpmdrake), is easily accessible from the start menu, by “install and remove packages”. A few of the games seem to be in odd categories – for instance, Aisleriot, a card solitaire game, is in “others”. There are very few adventure and puzzle games in the repositories when compared to those available for Debian, Ubuntu, and Mint. Since Mageia is a recent spinoff from Mandriva, it’s probably safe to assume the repository contents are nearly identical. 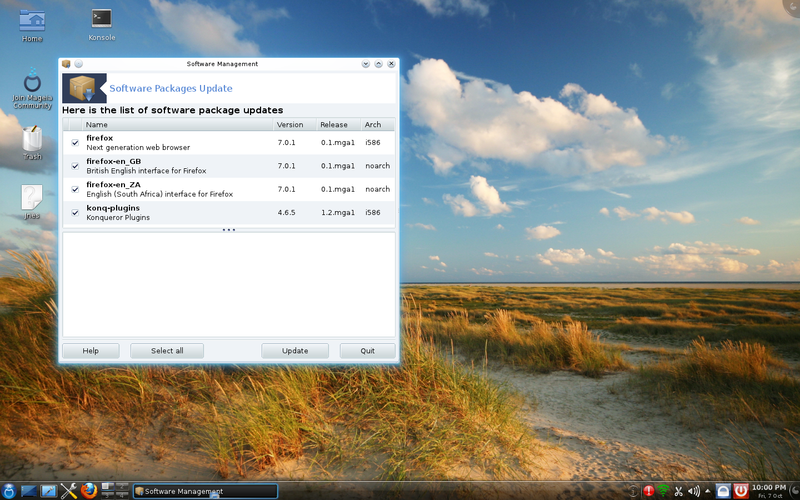 In addition to games, the repositories contain most of the usual programs that Linux users expect – among them Blender and Inkscape for graphics; Avidemux, Kdenlive, Kino, and Openshot for video editing; Hydrogen, Audacity, Ardour, and Rosegarden for music creation, and the main development tools for C, C++, Java, Python, Ruby and Perl. (Python 2.7 is available but the repositories don’t seem to include Python 3.2) Although the basic development tools can be installed, the programmers’ toolkit is more limited than in Fedora or Debian. I didn’t see any software for Haskell or Free Pascal, but Lua and OCaml can be installed. There are a couple of websites online where you can get extra rpms, however they are unofficial – and since rpms are not guaranteed to be compatible across the main 4 distros that use them, I’d advise caution there. Update your system. The ! in a red circle in the lower right status bar indicates when new updates are available. You will have to set your sources up first, which is simple. I usually select “all updates”, not just “security updates”. I was told of 513 updates when I first ran the program, and have had 2 or 3 additional notifications since then. Install Flash. Like Fedora, Flash is not installed by default. Look for “Flash-player-plugin” in the Software Management tool. Apple movie trailers play with no problem, which is not usually the case with Ubuntu and Mint. If you want to watch DVDs, you will have to do 3 things: first, make sure your source list includes the Tainted repositories. Second, install “libdvdcss2”. Finally, install the VLC media player. I tried several DVDs of ours, and although KDE offers 2 other choices of video player for movie watching (Totem and Dragon Player), it was only with VLC that I had sound and smooth play. If you intend to play more than the most casual games, you’ll need to install the restricted drivers. 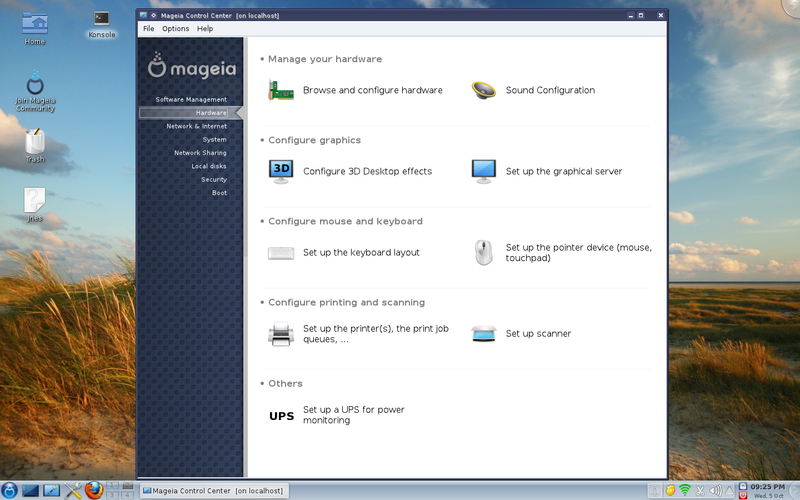 Go into the Mageia Control Center, click on the Hardware line, click on “set up the graphical server” (as seen below), and click on the top bar, which lists your graphics card. If you can use an enhanced driver, you will be given the choice to install it – which puts about 9 files in, then tells you to reboot. The default setting for how often you are notified about updates is 3 hours. I’d suggest changing it to 8 or 12. Updates seem to be coming in fairly often right at the moment. For reasons unknown, Mageia asks for your user password to update things, not the root password you need to enter to install or remove software using the Software Manager. – the main partition is just 12 GB. My laptop has 320 GB total, and I’m surprised that my choice to use the entire disk for Mageia assigns so little space for the main area. I already have less than 6 GB left, and I haven’t installed some of the larger games such as OpenArena or Tremulous. – There doesn’t seem to be a way to setup a single user to log in without a password while the remaining users still need to use theirs. You can set the system up to log in automatically when the computer is turned on, but it will then always login the same user. Mageia also has an “xguest” account that seems to be intended to let people who don’t have a user account access the computer temporarily. – the only 3D effects you can enable are the Compiz-Fusion ones. Although “Metisse” is a listed option, the 2 files needed cannot be found in the repositories. If you install the Compiz-Fusion files, you will be told to log out when they have finished. When you log back in, some effects become enabled automatically. The full range of effects can be turned on or off in the System Settings area (which is how you configure all KDE items). According to their release schedule (posted on July 17, 2011 at their blog), the next full release is planned for April 4, 2012. I look forward to seeing it. Although serious programmers might find it lacking, Mageia strikes me as very stable, containing most of what the typical user expects. Like its parent Mandriva, its main flaw is an insufficiently large repository. If the community could add more tested programs and games to the repository, it could go far. I like Mageia. 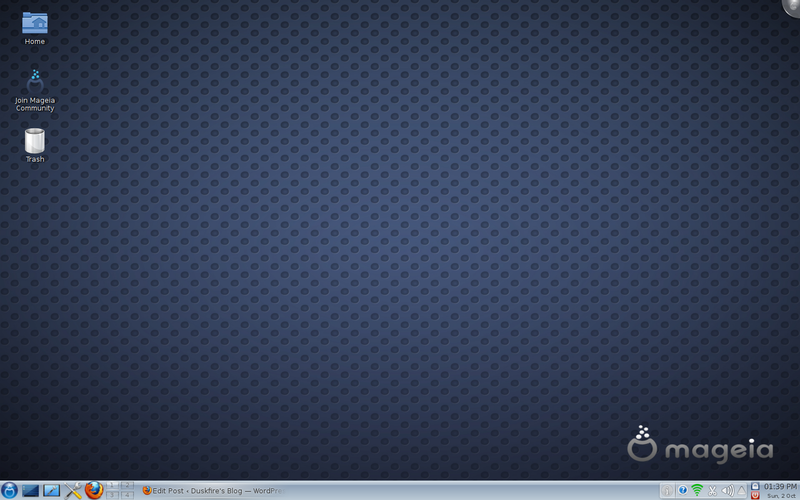 Tryed the new Mandriva 2011 to. But I dont like the so called “Rosa panel” remind me of the Unity desktop in Ubuntu. Mageia feels like the real Mandriva now. But why not write a review of the new Pardus 2011.2? A stabile and nice KDE distribution. Not so known by all but very good. Mageia is the best news for 2011! – I have an HP Deskjet printer = no problem. I’ll try with a Photosmart, not wireless, but probably there should be no problem too, I guess. – Log in without a password? Hugh, very bad security… Idem for automatic log in. Never do that! – I don’t care about 3-D effects. I hate them and never use them. I started with Mandrake 9.0 but dumped Mandriva when they they made the stupid mistake to go KDE4 before it worked. I moved to PCLinuxOS because it kept version 3.5, it did everything for me and I stayed with it because it was more reliable than Mandriva had become. I watched the development of Mageia and was impressed by the sensible way the team was organised. I thought that the outcome was going to be equally good and so it is. I’m looking forward to Mageia 2 but I don’t see how it can be much better than Mageia 1 for a domestic computer. After reading your post, I am thinking that I should try it. I also like clean desktop and stability. Now I am using ubuntu 10.04, but some worry about unity. Mageia is currently default distribution on my laptop, though sometimes I prefer to boot Xubuntu. It is nice and stable, and has whatever I need for the software. I noticed mageia has moved up into 6th place on distro watch and I downloaded the i586 file. After about half an hour I finally had the file and burned it to dvd. At the very end of the burn-after I was informed that it was “successful” a message popped up stating that some of the files may be corrupt. I waited so long for the download and burning to finish that I said the heck with it and tried to boot the dvd…which failed. 1) Can you mention what package system each distro uses in future? 2) Why don’t you put the games in /usr/? Thanks, I will make sure to mention the package systems when it isn’t clear. And yes, I could probably put games into /usr, I just hadn’t needed to before. Hello, KDE club! I think that you don’t have any problems with Mageia 2. And I must beg your pardon, but any lovers of the classic GNOME desktop exists around the world, also you’re never interesting for. Mageia was very small without a lot of apps what we’re knowing from Mandriva – but absolutely problemless! So I was a little afraid about Mageia 2. Alacarte is unworkable because “no module named gmenu”. For you mais this be so interesting like the last football match in Kuala Lumpur because in your KDE is Alacarte not existing. But 3 other desktops are unusable! I wanna wait for Mageia 3 what is planned for releasing in April 2013. And I hope that then this bug is fixed. If not so is Mageia in future only a distribution for KDE fans! But Mageia is not alone: In 6 bigger distributions Alacarte doesn’t work! If I think about any things in the last 2 years of GNOME 2 so can nobody tell me what other as this “Alacard bug” is a method that the user nomore can change the menus made from the programmer gods!